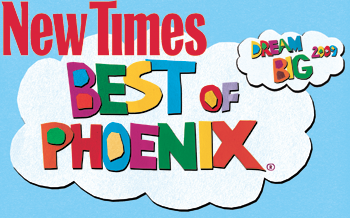 Improv AZ teamed up with ASU Gammage to do a flash mob inspired by Flashdance – The Musical. About 30 dancers, some amateur and some pro, kicked it up in front of a confused lunch crowd at Chandler Fashion Center to a song instantly familiar to anyone who lived through the 1980s. This was one of our most work-intensive flash mobs to date, with three rehearsals and a practice video to get everyone up to speed on the moves. Many in the group donned their 1980’s best, with side ponytails and cut up shirts. Gammage hooked everyone up with pink Flashdance leg warmers and shirts to complete the ensemble. We cut loose next to the food court at the beginning of the lunch rush on Saturday, April 13th. Things got off to a promising start, but as sometimes happens in flash mob, things didn’t go as planned. We had one spectator try to join in in the middle of the song. She jumped right into the center of our group and did her best to follow the moves. She was awesome, and huge props to her, whoever she is. We also had a small boy get his groove on right after we dispersed, proving that good music will get your feet moving at any age. You can check out some great Flashdance flash mob pictures on Flickr, and a big thanks to Chandler Fashion Center mall and ASU Gammage for making this happen! If you want to make sure you don’t miss any other flash mobs, join our email newsletter!